Hey! My name is Sharia Williamson. 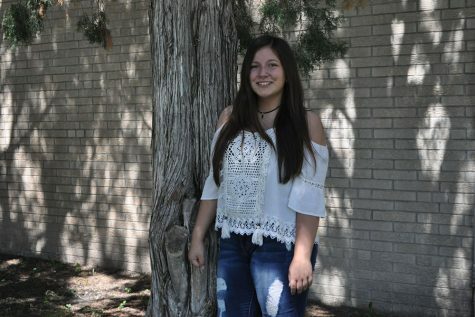 I am a seventeen year old student here at Alliance High School, and the senior editor, for the SPUD. After I graduate high school, I plan to attend the University of Lincoln Nebraska for my first couple of years post secondary, but then, would like to transfer to my dream school, Colorado State University in Fort Collins, Colorado, to finish my degree in veterinary medicine. This year, I am not in any extracurricular activities, other than the SPUD, as I am spending most of my time working and saving up for college. I started my first job at the local Dairy Queen when I was fourteen years old and in my 8th grade year. Over the years, I have moved up from only making ice cream, to packaging when I was sixteen, and now, I am a certified burger flipper. I am one of the few remaining original workers from 2014, and I plan to continue working at Dairy Queen until I move away to college in August 2018. In my spare time, you can commonly see me hanging out with my best friend and co-Editor-and-Chief, Safyre Iyce Yearling. We tend to drive down dirt roads, eat a lot of food, and jam out to a variety of music. I am extremely close with my mom, grandma, brother, and sister. Out of my siblings, I am mostly seen messing around with my sister, a previous writer for the SPUD and 2013 Alliance High School graduate, Nicole Williamson. Outside of friends and family, I love to try new things, traveling to different places, and spending time both in and outdoors. Writing for our school newspaper for the past two years left many unforgettable memories in my mind after traveling from city to city, interacting with different people, and saying stupid things that end up on our quote wall. I plan to continue improving my writing skill, writing for the Senior Side, and making one of a kind stories. This year is already looking good and I can’t wait to see where my final year as a journalist at Alliance High School takes me! Let’s all have a great year Spud Buds!